Looks like ‘flying car’ is the flavor of the season. Earlier last year, Uber, the ride sharing giant, had revealed its plans to deploy its flying taxis, in Dallas-Fort Worth, Texas and Dubai by 2020. Now, Intel has showed off its prototype of ‘Volocopter 2X’ – a drone made by German company Volocopter in partnership with the chipmaker – at the Consumer Electronics Show (CES) 2018 in Las Vegas, which the former claims is big enough to carry two passengers (up to a weight of 180 kilograms). Demonstrated live behind a cage as a safety precaution, the drone briefly flew on stage at the Park Theater, the huge concert hall at the Monte Carlo Park Theater in Las Vegas. Designed to operate as an autonomous air taxi, Volocopter 2X, is powered by Intel technology and runs on battery. It is the first fully electric vertical take-off and landing aircraft (eVOTL) designed for passenger transport. “The Intel® Flight Control Technology used in the Volocopter is based on the intelligence found in the Intel Falcon™ 8+ drone used for inspection, surveying, and mapping, showing the powerful intersection of data and autonomous technology. The Intel flight control technology analyzes environmental data with highly redundant sensors and is able to compensate for certain flight malfunctions. It can also accommodate for certain wind gusts and shifts in the center of gravity to help stabilize the position of the aircraft,” says Intel. The Volocopter began its journey to autonomous air taxis in 2013. The drone’s 18 rotors that can fly up to 100km/h are powered by nine independent battery systems. Each one of them powers a pair of rotors to ensure that the vehicle keeps flying in the event one or two battery packs fail and that does not seriously impact the stability of the Volocopter. Volocopter 2X can fly up to 17 miles on a single charge with a traveling speed of 43 mph. It takes 120 minutes to charge (with a 40-minute fast charge option) and currently has a flight time of 30 minutes, which is long enough for urban air-transportation, according to the creators, who are hoping to expand this duration to 1 hour in the near future. In the meanwhile, the batteries can be quickly swapped to increase the flight time until the technology improves, Volocopter says. It also has built-in emergency parachutes. Florian Reuter, Volocopter chief executive, said the company conducted the first-ever manned flight outdoors with a version of the vehicle in 2016, and has completed manned test flights in Germany and the first flight of an autonomous air taxi in the city of Dubai. 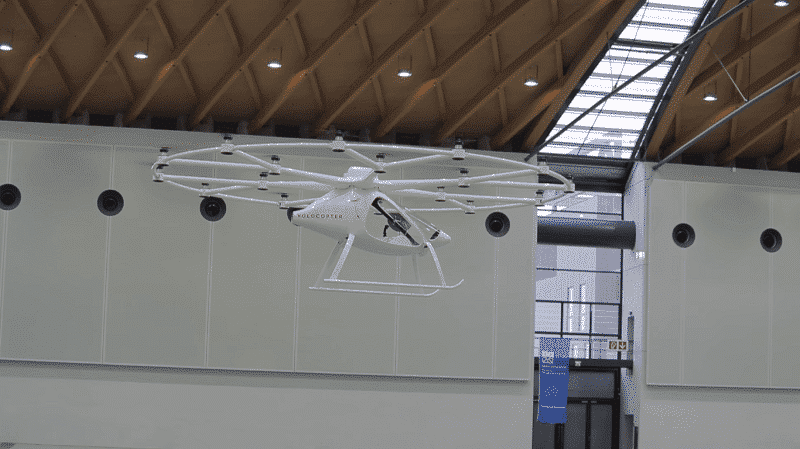 The company also revealed during the keynote that Krzanich was the world’s first passenger in a Volocopter, an event that took place in a Germany exhibition hall last month. Whether or not an autonomous sky taxi becomes a reality needs to be seen, the very idea of even discussing such a vehicle has given wings to our imagination of this being a reality in the distant future.